The trip begins at 12:00 a.m. as you leave your hotel addressing Moses Mountain for climbing. After getting down you visit St. Catherine monastery. It was named after St. Catherine who lived in Alexandria during the persecution of Christians. Egypt Travel representative will pick you up from your hotel in Taba by a private air-conditioned vehicle at 10:30 pm to drive to St. Catherine city, it takes about 2:30 hours driving. Upon arrival, start climbing Moses Mountain begins at 2:00 am and getting down at 7:00 am. 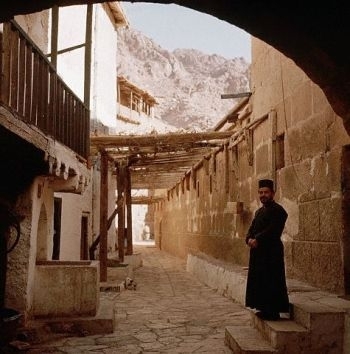 Then procees to visit St. Catherine monastery. It was named after St. Catherine who lived in Alexandria during the persecution of Christians. She was tortured by the Romans for her loyalty to Christianity. They cut off her head. Five Centuries later, a monk saw a vision in which her body was carried by angels and laid on a peak of mountain in Sinai. Therefore, monks carried her relies to the church which was named for her beside the monastery. Lunch at local resturant in Nuweibaa. Finally back to your hotel in Taba.